The big winner? Bismack Biyombo's Entourage. 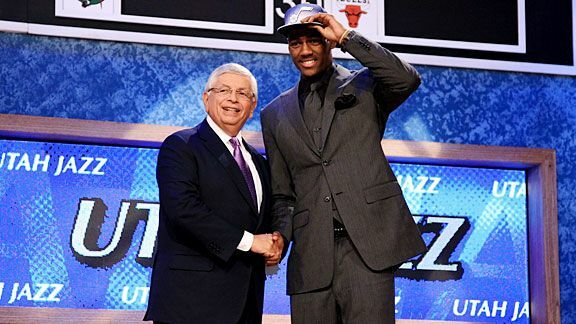 Ordinarily, the NBA draft is the graduation ceremony many of the draftees wouldn’t otherwise have. A name is called. A posse screams, hugs, and weeps. The future player climbs some steps and shakes Headmaster Stern’s hand. This year’s event, which was held in Newark, was ominously overshadowed by a looming player lockout (there were steady boos for Stern). You’ve just been hired, but your new bosses probably won’t be permitting you to start your job. Sensing this, too much of the class of 2011 came dressed for a funeral. Lots of dreary gray and black. Lots of nominal pocket squares exploding from jackets. Some looked used. A few of them were stuffed into the pocket so badly they constituted a floral arrangement. Markieff Morris was the 13th pick (he’s going to the Suns), and during ESPN’s coverage, the reporter Heather Cox sat down with Morris’s emotional twin brother, Marcus, whom the Rockets selected next, and asked how he’ll cope with being separated from Markieff. “I’ll send him some flowers or fruit,” he joked. But Marcus, you need only send him whatever’s growing from your suit. It didn’t seem possible for a rite that’s already such a weird conflation of other exchanges — it’s a draft, it’s a lottery, it’s human trafficking — to evoke one more. But Markieff Morris wore a slate three-piece suit whose jacket stretched from his nape almost to his knees. He looked like a pallbearer. Not to put to fine a point on it, but Enes Kanter’s favorite wrestler is the Undertaker. In polite stone-gray and a canary tie, he didn’t disappoint. My heart went out to Alec Burke. He might have been going for something with his charcoal-on-onyx three-piece with pocket belch. But he never got there. It was a gray so deep and so ashy that the only cure was lotion. Much has been made about this year’s class featuring lacking someone with LeBron-quality charisma, and poring over this bunch you can see what they mean. The NBA isn’t desperate for talent — the top 15 has plenty of that. It needs superstars. There is Jimmer Fredette. He’s greatish. He’s white. And there’s hope. But it was hard to get excited about his banker’s costume: three pieces over a blue gingham shirt and a tie the width of his wingspan. 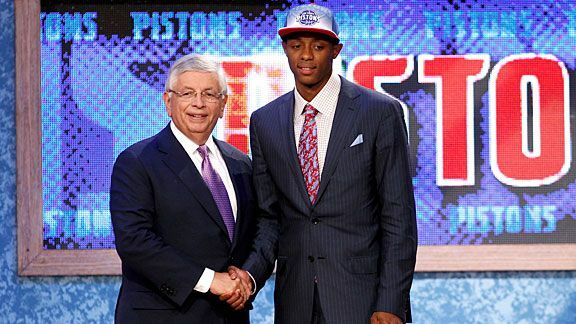 To the credit of Brandon Knight, he attended the funeral as an usher — dark suit, math-graph shirt, a tie that could only have belonged to a favorite uncle. The burnished leather shoes were a smart touch. The Raptors-bound Lithuanian Jonas Valanciunas wore a suit (black, green tie) seemingly because someone told him he had to. He’s another player who gives people Pau Gasol hot flashes. We’ll see. But last night, Valanciunas just looked overheated. He was the most honestly attired guy of the evening: I don’t know fashion, I know basketball. It was touching. Backstage, he was nervous with ESPN’s Mark Jones, emitting the I-need-a-drink air of a guy already at the reception. Presumably, it’s for Jan Vesely’s wedding. When Vesely’s name was called (6th pick, Washington Wizards), a tall blonde popped up from her seat and gave him a “you may now kiss the bride” smooch. His suit was strictly “you may now have your keys, sir.” It was a smart diversion. The blonde was voted best accessory. The solemnity afoot last night was dismaying. The team cap affixed on the head of each draftee was a crowning affront to fun. What stylists there were had dressed their clients to impress for jobs they’ve already got — the funeral attire could easily have doubled as hire-me-wear. So who were all serious clothes for? In the case of a lot draftees, that’s easy. Another pressure-point ritual: Dressing for your mother. Or rather: Letting you mother dress you. Not for everything. Just on the day it most matters to her. Sunday. Sunday is the day you act — as she might put it — like you got some sense. In the case of players, this means forever erring on the side of churchy. Few men manage to turn churchy into a style. The professional sports business is full of players and commentators who could leave the arena or the broadcast studio and hit the stage at Ebenezer Baptist. There was more than a little Ebenezer Baptist in Newark last night. Backstage, Jones declared Marcus Morris one the top-five best dressed. We disagree. But I’d like to know his other four. I couldn’t get that high. Maybe, if I include the ESPN staff. Jay Bilas looked fetching in a simple slate suit, white shirt, and black tie. You see only half, but the half you could see was fetching. I thought that with Kawhi Leonard they’d saved the best for 15th. But his Thom Browne-esque good-boy suit (navy with white piping) was the right idea with the wrong tie, shirt, pocket square, and cornrows. The jacket was actually wearing him. But there was a flash of wit, and it came from Kemba Walker. This was what we came to see — a flash of excitement, some risk. He took the stage in a defiantly tailored cobalt suit (in two merciful pieces) and a skinny plaid tie, pinned to a tiny bar. People will shout that Walker looks so good because there’s less of him to dress (he’s merely six feet tall), and I will roll my eyes. Besides Fredette, Walker was the one other guy who looked happy before his name was called. He dressed like a man with no worries, lockout be damned. It wasn’t perfect. His cappuccino-colored wingtips with carnation topping were the best part of a different outfit. But if he’s serious about this, he’ll be the best-dressed man on the Bobcats. Still, with all due respect to Walker, he came in a somewhat distant second. 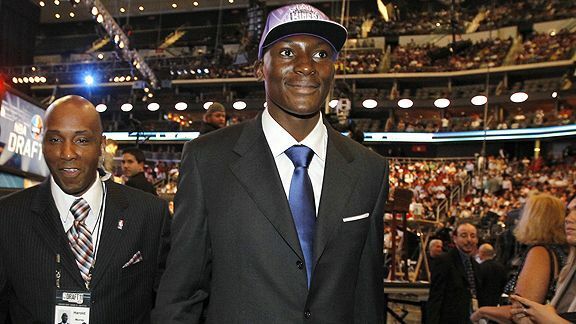 When Stern announced that the Congolese Bismack Biyombo would be going to Sacramento, a dapper gentleman stood up to hug him.1 This someone wore a perfectly tailored salmon-colored suit and an open shirt, and, if memory serves, nothing in the jacket pocket. Either way, it was million-dollar perfection. I don’t know who this man is or he even if plays basketball, but if the scouts have any sense they’ll track him down and make him an offer. Wesley Morris is a contributing writer to Grantland. He reviews movies for the Boston Globe and tweets at the address @wesley_morris. Editor’s Note: That would be Serge Ibaka.